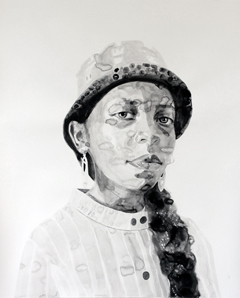 The exhibition The Whispering Spring features three new groups of ink paintings that the South African artist Tanya Poole (b. 1971 in St John’s, Canada) made in connection with a visit to the research institute of the Albany Natural History Museum in Makhanda, South Africa. 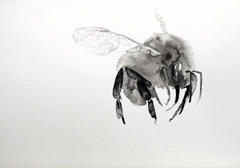 The Swarm, a “swarm” of some 140 small-format works depicting bees and other insects, is flanked by eight monumental works on paper from the series At the Edge of the Forest, in which the artist’s fascinating glazing technique evokes views up into the treetops. This natural cosmos is contrasted with seven portraits of female scientists. Visitors entering the gallery are instantly immersed in an image world of vegetation and nature. 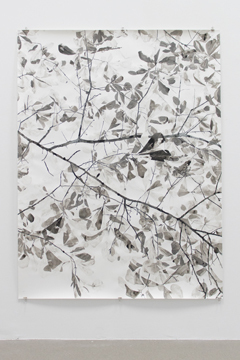 Tanya Poole’s virtuoso command of ink on paper allows her to achieve arresting sculptural effects, which, together with the huge format of the treetops and the dynamic insect-picture installation, create an all-enveloping setting. 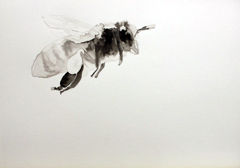 Poole’s insects and bees alternate between sharply detailed renderings and radical abstraction. Close observation allows her to meld anatomical precision with a high degree of artistic freedom. In these days of massive declines in insect populations and rampant destruction of natural habitats, Poole puts a tangible face on the diffuse mass that is otherwise beyond our ken. She formed the idea for the series in the course of conversations with women scientists at the Albany Natural History Museum, prompting her to bring together three different themes: science, in the renderings of insects; the poetry of nature; and finally the social fabric of the working environment at the research institute. The latter captured her interest when she learned of the difficulties experienced by women researchers in a field where patriarchal structures still prevail. With scant time available alongside their family duties for writing scientific publications, and given an atmosphere of discrimination and social exclusion, their research results and the women themselves are deprived of the visibility they deserve. Tanya Poole’s portraits nevertheless project a sense of strength, self-confidence, and pride. Once again, Poole has discovered here a broader and quite complex conceptual framework for her individually compelling works in ink on paper. As already seen in her work Thozama and Rose, she continues to explore settings where different worlds collide and social tensions are keenly felt. The various motifs interweave to form a network of ideas and associations that inspire wonder at the creative forces, magic, and beauty of nature, but also alarm at its fragility.